My nanny is on vacation and I have to keep up with my hyper, two-year-old little one so I have to make a really quick and easy yet nutritious dinner for my family. 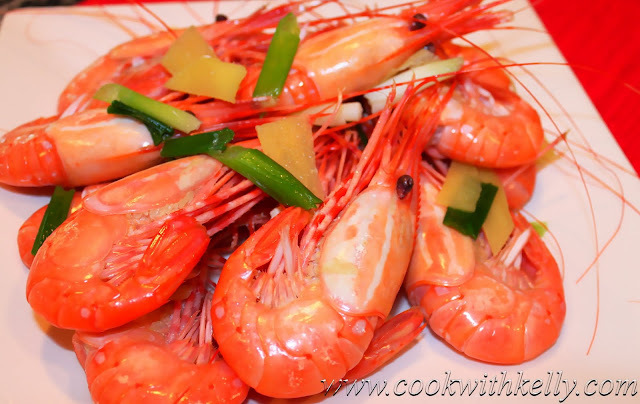 This White Boiled Spotted Prawn with Ginger and Green Onion can be made in 15 minutes and it's very healthy and delicious. My daughter ate 7 prawns for the very first time and she loved it so much. This dish is great for kids because prawns are a rich source of protein that helps your little one to grow. It's also fun for them to play with the prawn and then enjoy eating them at the same time. The key to this dish is using live prawns. 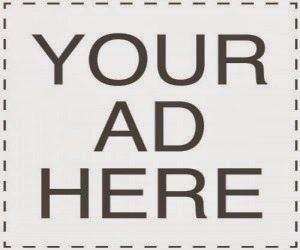 We live in Vancouver, BC, Canada where we have the freshest seafood all year long. Late spring and early summer is spotted prawn season and you can get them for really cheap in Chinatown. "White Boiled" in Chinese means a simple cooking style so there is not a lot of extra sauce added. Fresh live prawns are naturally juicy and delicious so they don't require any fancy cooking style. Cut the green onion approximately an inch long. Julienne the green chili peppers. In a small bowl, add all the dipping sauce ingredients and mix everything evenly. In a medium pot, bring half pot of water to boil. Add olive oil, salt, green onion, sliced ginger and all the prawns to the boiling water and cover. When the water is boiling again, transfer all the prawns to a serving plate. 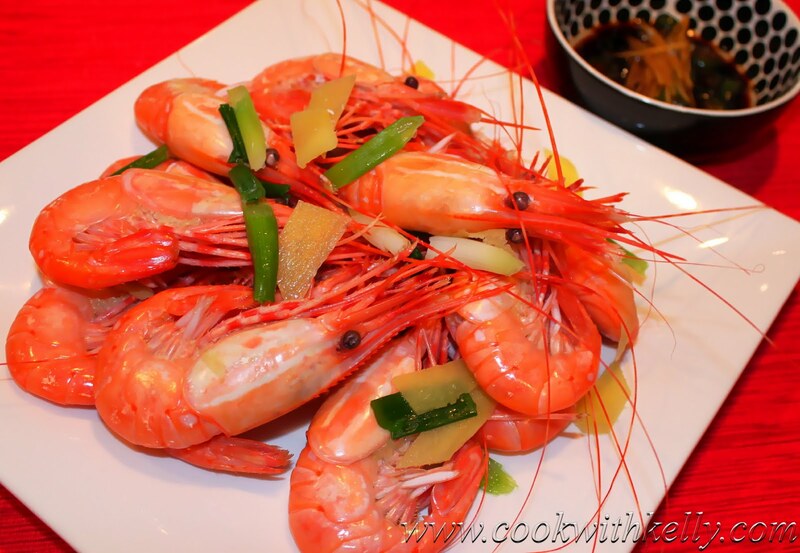 Now you can enjoy your White Boiled Spotted Prawn with Ginger and Green Onion! Thanks for stopping by Kelly.Love everything about your blog,prawns look super inviting and delicious. Easy, quick, healthy and delicious. Yup, those are the requirements for any dinner when chasing little kids. Not always easy to come up with ideas, but these look great! Quick and easy, my kind of cooking. I'm following.